Hi there, how’s Tuesday treating you? Okay here, things have settled down just slightly at work after an insanely busy Monday – servers crashing, software glitches, hard drive crashes – it was mayhem I tell ya! 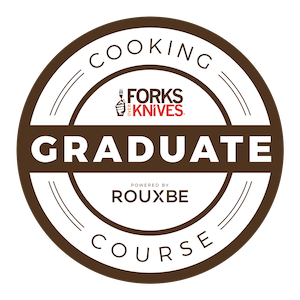 I’m glad I went to the raw class last weekend because it helped renew my motivation to be high raw, of course the summer also helps making me crave cold salads, frozen grapes and lots of fresh fruits. Being able to discuss health benefits with other raw foodies and hear inspirational stories of improved health in person was a positive experience. 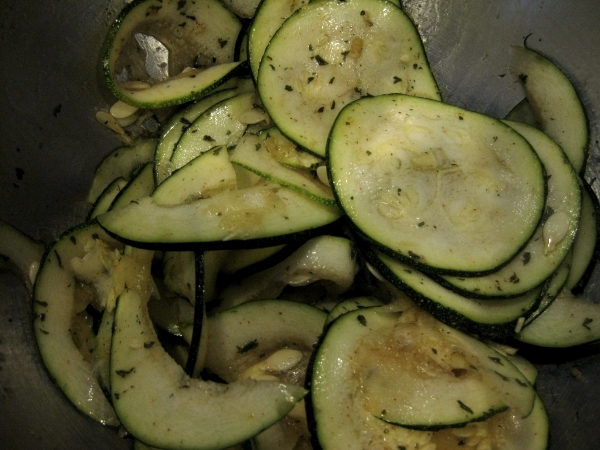 Anyway, I did load my Excalibur dehydrator this weekend with a recipe I’ve been meaning to try from Kristen’s Sides & Snacks book, zucchini munchies. 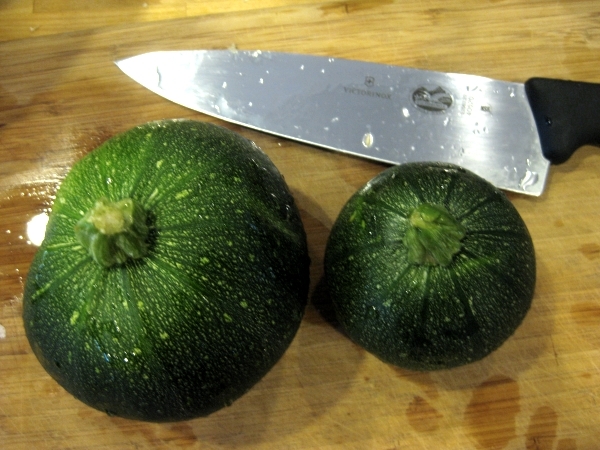 But instead of using zucchini, I used the round zucchini-like squashes I picked up at a farmer’s market last week. I set the mandolin slicer for 1/8″ thick slices and marinated the slices for about 20 minutes. And were very good with a lot of spicy garlic kick, in fact I might tone down the spices for the next batch and that’s saying a lot for me! They had a thin, crispy Lays-like texture, but less greasy and will satisfy a salty snack craving easily. 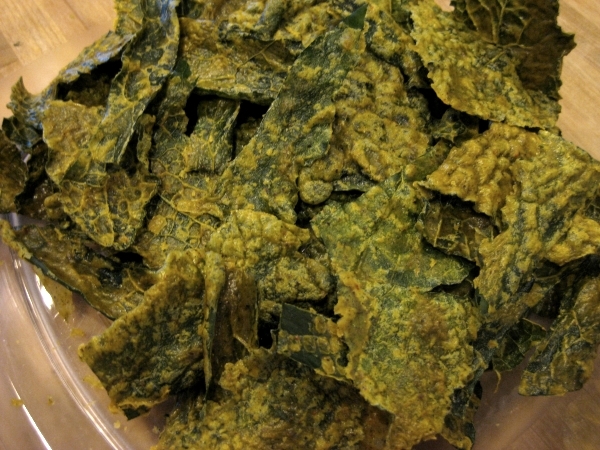 While I was running the dehydrator, I also loaded it with more kale chips using a yellow bell pepper for this batch. I added a little water to the hemp pepper sauce in the Vita-Mix to dilute it more this time for a more even chip coating and these didn’t last long! And since the dehydrator was going to be running for awhile, why not dry tomatoes too? I restocked my inventory for fresh marinara sauce this week. 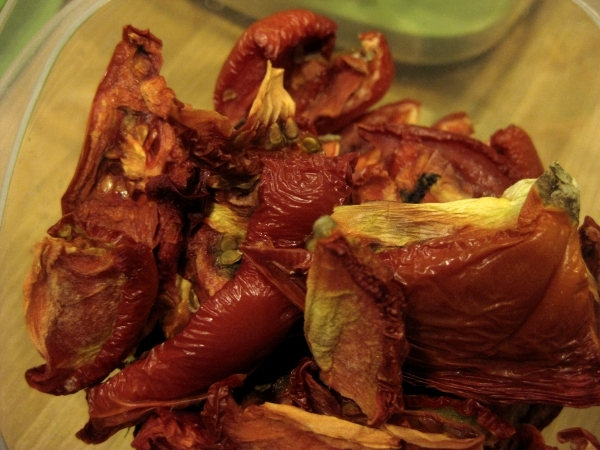 Home dried tomatoes are much better to me than store bought sun-dried tomatoes which are always too salty. Lunch yesterday was more chaos while watching my nieces, but I did manage to throw a decent salad together. 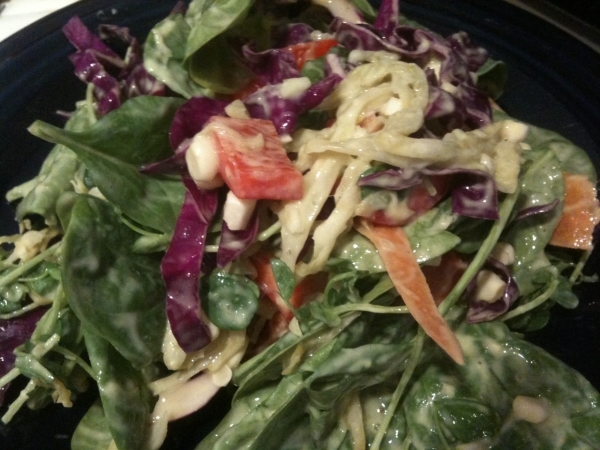 Spinach, sprouts, red cabbage, red pepper, carrots and sauerkraut with avocado dressing. Trying to continue my high raw intake for the day, I fell back on one of my favorite raw comfort foods – Creamy Cauliflower. 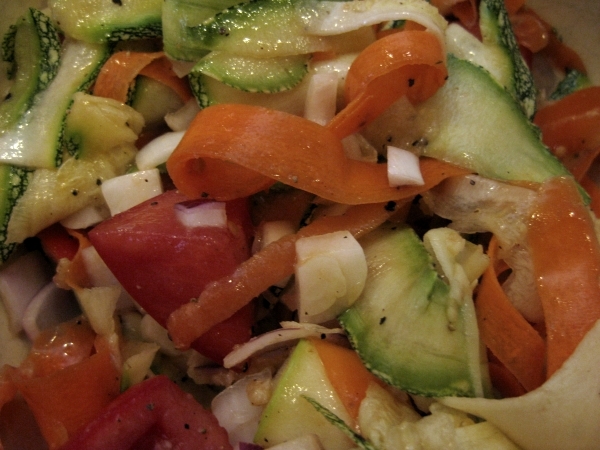 Paired with a light, Italian themed salad of tomatoes, zucchini, carrots, red onion, garlic, lemon juice, olive oil and lemon pepper seasoning. The carrots and zucchini were shaved into ribbons with a peeler for a light, softer texture and the light dressing went nice with the rosemary in the cauliflower dish, but not overpowering it. 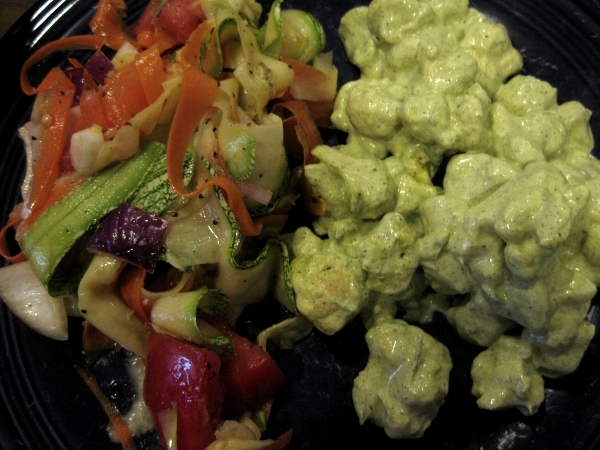 Hubby actually had a vegan dinner too. 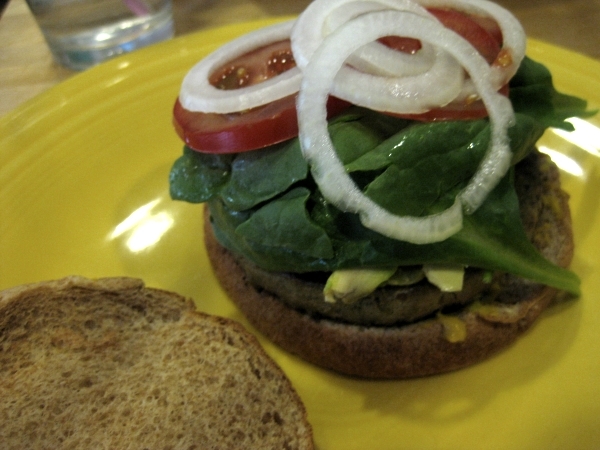 Falafel Sunshine Patty with plenty of fresh fixings. He said this was one if his favorite flavors so far and it had great texture that he wouldn’t call a burger replacement, but tasty alternative to it. Because I usually make way too much salad, I had plenty of leftovers for lunch today. 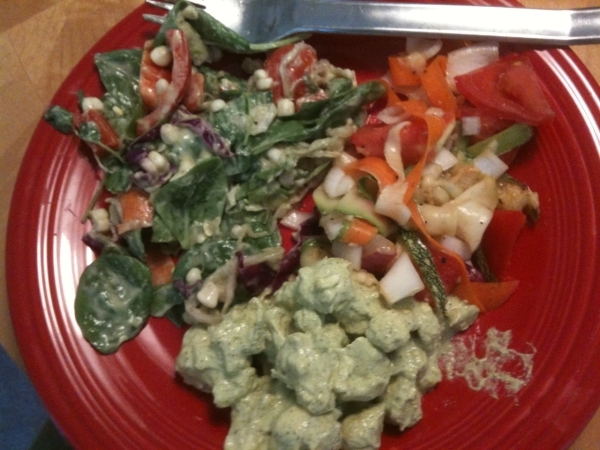 Two different types of salad and more creamy cauliflower, I definitely got my veggie fill will this one! Excuse the messy plate placement, I was on limited time during a lunch break. 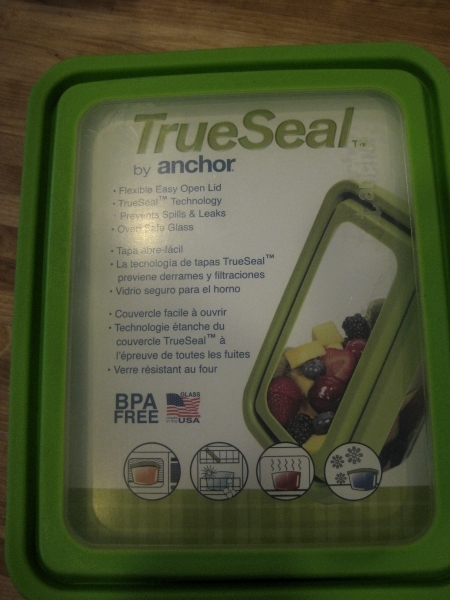 I picked up this Anchor 11-cup TrueSeal at Sur La Table because it’s perfect for freezer/fridge storage or toting dishes to gatherings. I’m always looking for good freezer options to store raw breads, crackers, seeds, nut pulp, etc. and this seems like an awesome option so far that’s easier to clean than the Oxo plastic locking freezer container I have. 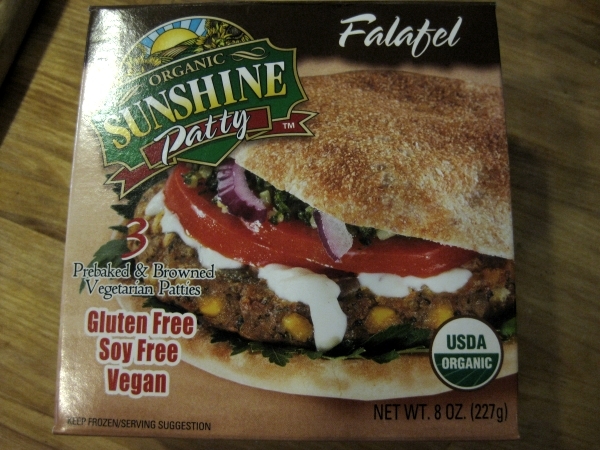 Ooh, I keep looking for those falafel sunshine burgers, but I’ve yet to find them! Looks like you had a lot of fun with the dehydrator! 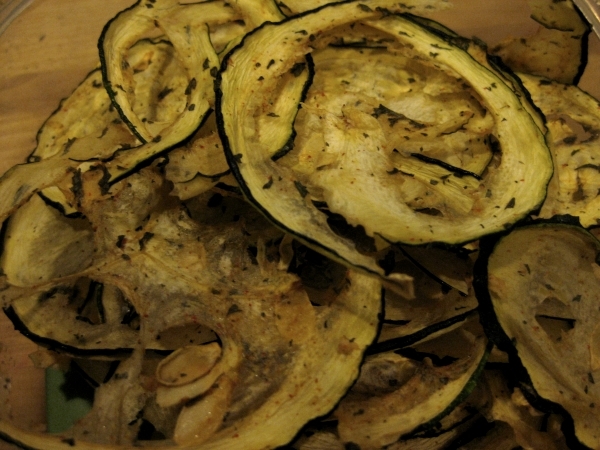 I tried to make a similar zucchini recipe in my oven last summer and it didn’t turn out so great. Nice to have the dehydrator to make sure they turn out yummy! Oh hehehehe – is that a zucchini??!!! sooooo cute :-) I love that short round version of zucchini ! The kale chip looks really good too!